Ethiopia follows the Julian calendar, which is about 7-8 years behind ours. Because of that, their Christmas falls on January 7th. In Ethiopia, it is a very religious holiday, which they celebrate with a 40 day fast which is broken on Genna. They spend the day traveling from church to church, with a 3 hour mass. Traditionally it is called Lidet, but the word Genna comes from a game (similar to hockey) that the boys play every year. How did we celebrate? 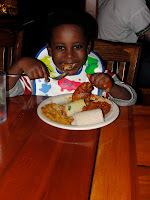 By joining 20 other adoptive families for a meal in Portland at The Horn of Africa. 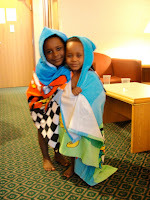 We also decided to spend the night in Portland, so the boys could go swimming and just make a big deal of their first Genna as Americans. 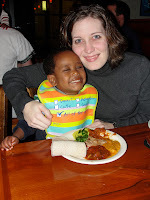 It was funny, with all the talk about how much they miss injera, Ethiopian food, Tegan was not all that impressed. 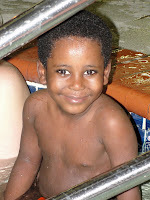 I guess he is to Americanized, and pizza, french fries and chicken nuggets have become his favorite food!